дома » ARMENIAN - ENGLISH CONVERSATION GUIDE հայերեն անգլերեն զրուցարան » ՀԱՅԵՐԵՆ — ԱՆԳԼԵՐԵՆ ԶՐՈՒՑԱՐԱՆ: ԵՐԿՐՈՐԴ ՄԱՍ: 4. ՖԻՆԱՆՍՆԵՐ. FINANCE. 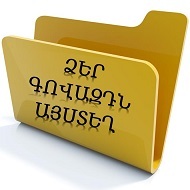 Ներբեռնել լավ որակով ( PDF) 4. ՖԻՆԱՆՍՆԵՐ. FINANCE. ֆայնանս:( էջ 70-86). համար: They drew on us for 5000 roubles. Your plans entail great expenses. smth., make capita! of smth. Previous post: ՀԱՅԵՐԵՆ — ԱՆԳԼԵՐԵՆ ԶՐՈՒՑԱՐԱՆ: ԵՐԿՐՈՐԴ ՄԱՍ: 3. ԺՈՂՈՎՐԴԱԿԱՆ ՏՆՏԵՍՈՒԹՅՈՒՆ. ECONOMICS. Next post: ՀԱՅԵՐԵՆ — ԱՆԳԼԵՐԵՆ ԶՐՈՒՑԱՐԱՆ: ԵՐԿՐՈՐԴ ՄԱՍ: 5.ԱՌԵՎՏՈԻՐ. TRADE.